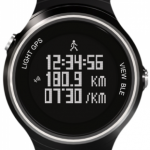 The ZTE Venus G1 is a GPS running watch that is meant to be used during marathons and long-range events. Even with GPS active, the watch will last for about eight hours on a single charge. The case is waterproof up to 50M, even though it�s made of plastic. It will sync with Android and iOS phones via Bluetooth. Unfortunately, there�s no word on whether or not it will be available outside of China.